Good afternoon! Finally, our team is back in MLS action tonight, @Rio Tinto Stadium, against the always tough Real Salt Lake (9:00pm ET, MSG). This is a match-up of two desperate teams, with both RBNY & RSL in danger of missing out on the playoffs if full points aren't picked up quickly. With that in mind, let's see how both teams come into this one. Real Salt Lake is coming off two straight losses in League play and finds itself in 5th place of MLS' tough Western Conference. With morale a question mark, after their latest loss, RSL coach Jason Kreiss is demanding a "huge effort" against the Red Bulls today. After today's game, RSL will play three straight on the road. Needless to say, they'll be looking for all three points today. It's crunch time for the NY Red Bulls. Our team is currently tied for third place in the Eastern Conference, with Sporting Kansas City, and needs to start picking up full points to stay in the playoff hunt. Dane Richards is out, due to the Red Card he picked up against FC Dallas, but Frank Rost should be on the field despite picking up an injury on the flight back from London (I kid you not). The Red Bulls will show RSL a significant amount of respect, but they'll know the former MLS Champion will be missing playmaker Javier Morales and Center Back Jamison Olave. 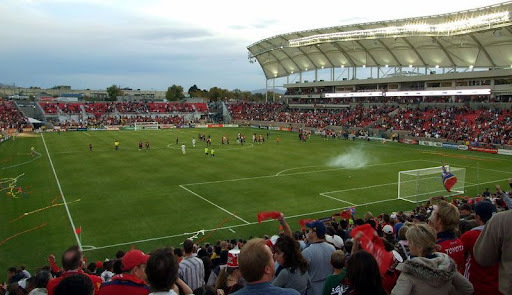 Will the first RBNY League win @Rio Tinto be in the cards today? We can only hope so. With all that in mind, let's get to some predictions. This is it. The friendlies are over, the boys are back in the States, and we only have one game a week from here until the end of the season. It's make or break time. Currently - unbelievably - the Red Bulls sit in one of the wildcard playoff spots. They've been losing ground steadily on teams like Columbus and Sporting KC, while Philadelphia has managed to keep themselves above RBNY with a number of draws. Amazingly, RSL - one of the preseason favorites - also sits in a wild card spot, albeit on many fewer games played. No Luke Rodgers for RBNY, so Juan Agudelo will have to step in up in his absence. Unfortunately, Dane Richards will also be missing because of his red card against Dallas, so we could have another Ballouchy sighting. RSL has hit their worst patch of the season and will be desperate to bounce back. I'll go with a 1-1 draw. Goals by Espindola and Agudelo. With a great win, against PSG, and a great draw, against The Arsenal, last weekend, the Red Bulls will be oozing confidence today. I'm going to predict a massive RBNY victory. Not massive, as in we'll score lots of goals. Massive in that we'll get all three points here today. I'll call it 1-0 to RBNY, with TH14 netting his 12th of the year. Red Bulls need to pick up a minimum of 4 wins and a few draws to eke their way into the playoffs now. As much as I want tonight to result in one of those wins, I'm afraid it's going to be yet another draw. If we're going to have a chance, it's my hope that we deal with the absence of Dane Richards by moving Solli up and starting Chris Albright. Of course, we still won't avoid Ballouchy, with word that Lindpere is questionable for the match I expect we'll be suffering through another Medhi display. I see a 1-1 draw at Rio Tinto. Look for Solli to cross one in the box and Agudelo to finish it. performance by Mehdi Ballouchy) I would normally be predicting dread. But I would argue RSL is actually in a worse position than we are. We win, 1-2, one from Lindpere and one from Titi. I think Rost will have a little more control of the backline, a bit more composure. Desperately repressing my realistic side! That's all for now. We'll be all over this one in the coming days. Viper out!